We love to eat. Ask us about our travels around the city or the world and we will inevitably tell you what we ate. From street tacos in San Antonio to the best burger in Chattanooga, we know our stuff. We also all love to cook and summer is a cook’s delight. 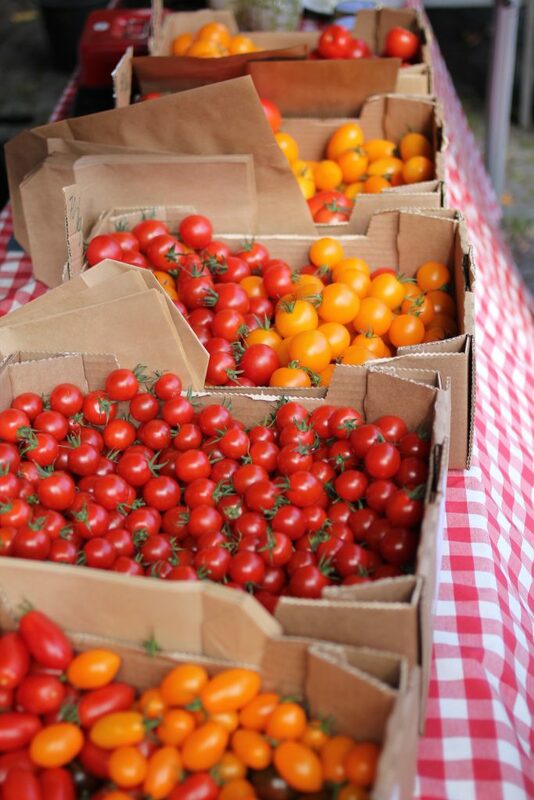 Chattanooga is home to one of the country’s best farmer’s markets and we all take advantage of the offerings. Being from the south (most of us, at least) we also bond over food. We would love to share our love of food with you. As the summer progresses, we will share our favorite recipes. Check back often. Diane Patty is famous for being an amazing cook and entertainer extraordinaire. Ro-Tel Chicken is one of her children’s favorite dishes and is requested for family gatherings. The chocolate cream pie is Diane’s grandmother’s recipe that ‘has been around forever”. 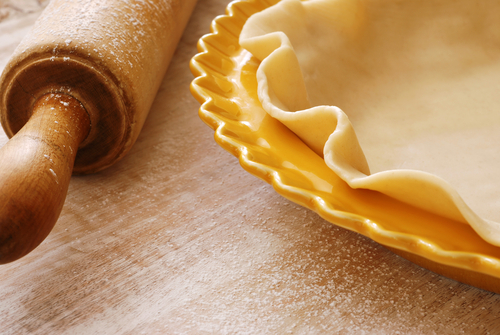 Diane makes her own scratch pie crust , but your secret is safe with us if you don’t. Saute bell pepper, onion and mushroom. 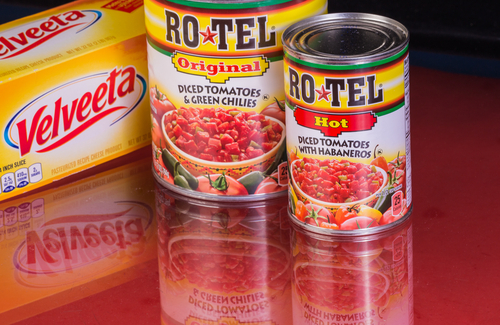 Add Ro-Tel, mustard, Velveeta and chicken broth: melt. Cook spaghetti while the mixture is melting. combine chicken, cheese mixture and spaghetti. Pour into a lightly greased dish and cook for 30 minutes. Yield 8-10 servings. Mix cocoa, flour and sugar thoroughly. Add milk slowly. Separate eggs, add beaten egg yolks, cook in a double boiler until thick. Add butter. Pour in pie shell. Whip egg whites to for soft peaks . Add 5-6 tablespoons of sugar gradually. Add meringue to top of pie. Bake at 300 degrees for 12-15 minutes. Turn oven down to 200 degrees and continue baking for 10 minutes. Add milk and vinegar together. Leave about 1/2 cup of the flour on counter to work with later. Mix remaining flour, salt and shortening together with mixer until crumbly. Using a fork, add milk mixture to flour mixture. Work in remaining flour, adding more if necessary. Roll crust as usual. Makes 2 single crusts. This recipe is very short, but bakes crispy and golden pie crusts. Carmen Patty, world traveling foodie, loves to pair Elqui Carmenere Syrah or King Estate Pinot Gris with her favorite brushetta recipe. 1. Brush each piece of bread with olive oil on one side. Place the baguette slices on a large rimmed baking sheet, oiled side down. Transfer to your pre-heated oven and bake for 4-5 minutes. Don’t bake them much longer then this or the bread will become too crunchy. Remove the baking sheet from your oven. Using a pair of tongs, flip each baguette slice over so the oiled side is facing up. Set aside. 2. Meanwhile, heat 1 tablespoon of the olive oil in a skillet over medium heat. Add the diced shallot and sauté until it’s just starting to get soft, approximately 2 minutes. Add the cherry tomatoes and a pinch of salt and pepper. Sauté until the tomatoes start to get soft and juicy, but still retain their shape (you don’t want them to fully collapse), about 3-4 minutes. Remove from the heat and set aside to cool slightly. 3. Assemble the bruschetta. Spread approximately 1-2 teaspoons of the cheese onto each toasted baguette slice. Then spread approximately 1 teaspoon of pesto sauce on top of the ricotta. Top with the sauteed tomatoes and a drizzle of balsamic vinegar. Serve immediately. Tanya Swann’s favorite dish to bring to a party? 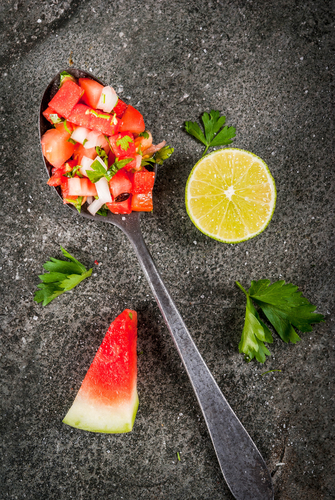 Martha Foose’s watermelon salsa, courtesy of Screen Doors and Sweet Tea. In a large bowl, combine the watermelon, cantaloupe, onions, jalapeno, salt, sugar, chile powder, cilantro, basil, and lime zest and juice. Stir together. Note: This gets very juicy. Serve with a lot of chips and be prepared for people to ask for the recipe! In a large bowl mix the lamb meat with big pinch of salt, paprika, garlic powder (or fresh garlic! ), breadcrumbs , finely chopped onion, egg, feta cheese and cilantro. and with the palms of your hands roll into meatballs. In a skillet heat 2 tablespoons of avocado oil on medium heat. cook each meatball for about 8-12 minutes, until cooked through, rolling them around as to get all sides of the meatball cooked. set aside on paper towels. For the yogurt, mix the mint and lemon juice with 1/2 teaspoon salt. set aside. 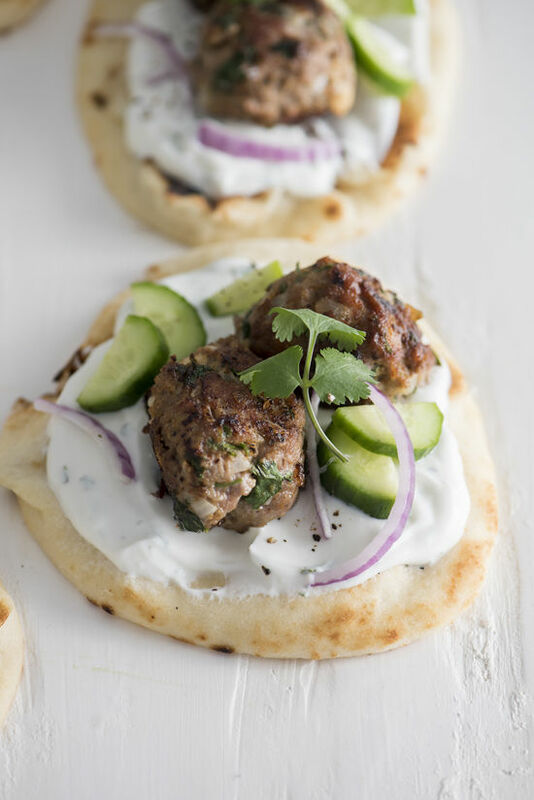 To assemble start with your flatbread and a good smear of the mint yogurt, lamb meatballs, diced cucumber and slivers of red onion. Preheat oven 350 degrees. Line a baking sheet with parchment paper. In a large bowl, add egg whites, sugar, salt, almond extract, and vanilla extract. With a hand mixer, beat egg white mixture until thick and frothy, about 2-3 minutes. Add coconut to egg white mixture, and stir until combined. With a small cookie scoop or two spoons, scoop the macaroons into 1″ balls. Place on the baking sheet, about 1-2″ apart. Bake for about 20-25 minutes, or until the macaroons are golden brown. Lisa lives on a family farm in what was her grandmother’s house. Three generations still live on the farms that is home to a vineyard, chickens and garden. 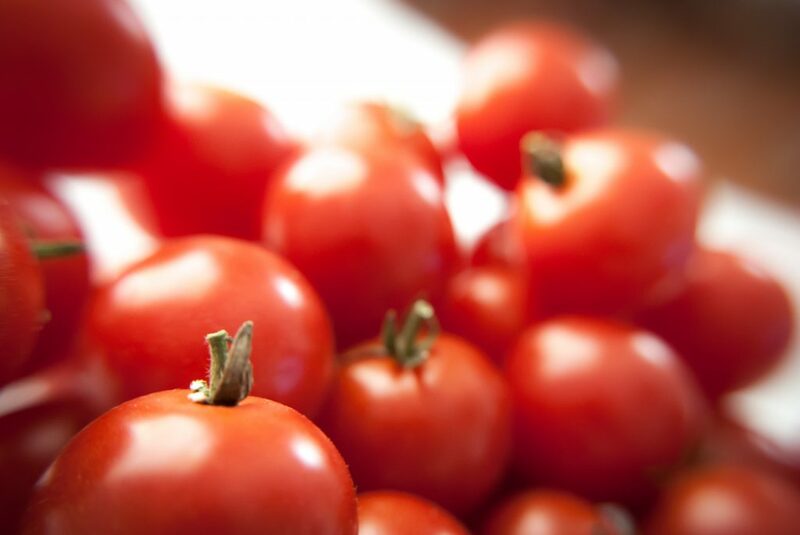 This recipe is fantastic with tomatoes straight out of the garden. Combine tomato wedges, cucumber slices and onion rings in a large bowl. Set aside. Combine vinegar and remaining ingredients; beat using a wire whisk, until mixture is smooth. Pour dressing over vegetables, tossing gently. Cover and chill at least hours, stirring occasionally. Serve with a slotted spoon. Serves 6. Mandi lives on a beautiful, private property complete with a fish stocked pond, chicken coop and amazing garden. 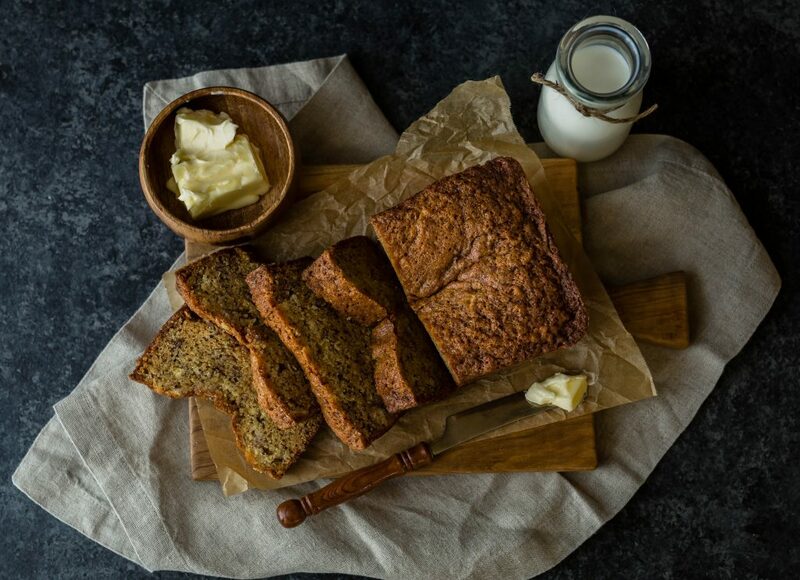 When the zucchini gets growing, she makes batches of her delicious zucchini bread and shares it with her friends, family and clients.